» ...Documentation Home » Oracle Solaris 11.4 Information Library » Managing Auditing in Oracle® ... » About Auditing in Oracle Solaris » How Is Auditing Configured? You use the auditconfig command to specify the audit parameters for your system. In addition, you can modify the audit flags to preselect which audit classes are to be audited for a process. The audit service, auditd, tracks auditable actions that occur on a system. See Audit Service and the auditd(8) man page. 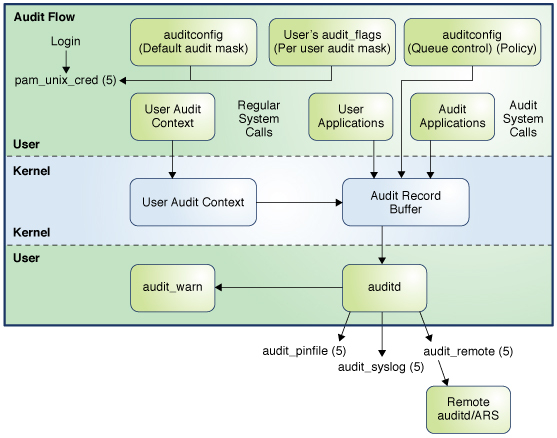 The audit_remote plugin sends binary audit records across a protected link to a remote audit service that is running an audit remote server (ARS). Records received by the remote server can only be sent to a local binary file. See Managing the Audit Remote Server. Note - In addition to forwarding audit data to the plugins as described in this section, by default, audit records in the sstore meta-class are automatically forwarded to the Oracle Solaris StatsStore. For more information, see sstore Audit Meta-Class.